Heroes of Freeport present the backstory of some of the characters depicted in art (and sometimes text) in Freeport: City of Adventure, and the Return to Freeport adventure path. They serve as examples of the kinds of characters that may be found in the City of Freeport, and be used as inspiration for PCs or as NPC backgrounds for the GM to draw from. 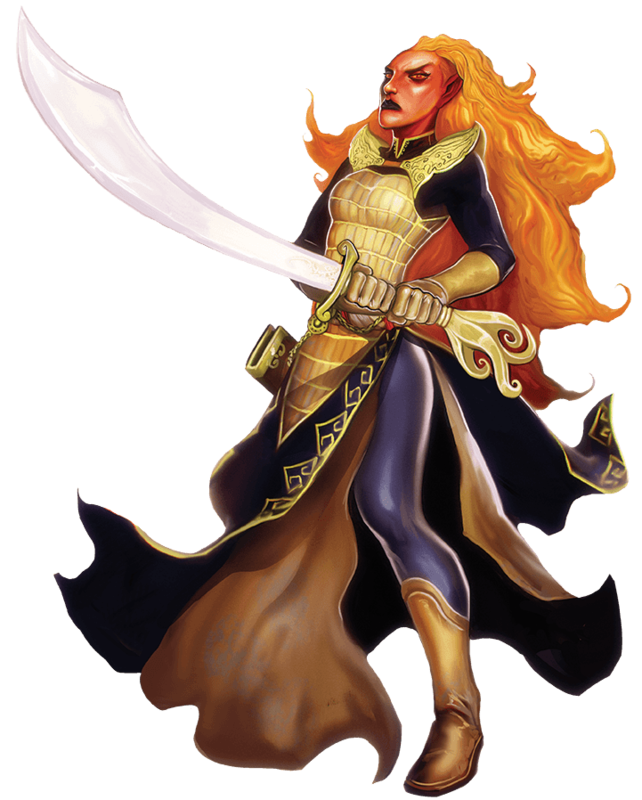 Janica is a third-generation citizen of Kizmir, and the granddaughter of Captain Janyr Flameblade who commanded the sailing ship Sultan’s Fist 102 years ago when the azhar Sultan Mustafa VI invaded the southern coast of the Continent. Her grandfather was at the front of the forces that marched northward and helped claim the land that is now the nation of Kizmir, and in return he was rewarded with lands and privileges. Along with several other ex-soldiers, Janyr founded Tzeset, a large town in northern Kizmir lying between the Ozkurt Forest and the Broken Land. The people of Tzeset turned their eyes to the woods of the Ozkurt Forest, and began to conquer them. The trees on the northern edge of the Ozkurt are ancient, tall, and strong, making them perfect for long keels and high masts. Felling these trees and shipping them south to the nation’s capital of Milsar has brought wealth to Tzeset for more than fifty years. Such work is not without risks – kobold warrens often raid the logging operations, and larger, more dangerous creatures sometimes attack out of the Broken Lands, but within the stout walls of the town the families of Tzeset grew wealthy and content. As long as the lumber continues to be shipped to Kizmir’s great shipyards, to ensure the sea fleets of Sultan Mourtos II (Master of the Azhar and Keeper of the Eternal Flame) are always expanding, the Sultanate does not much care about local affairs. Normally, this suited Janica and her family quite well. Fiercely independent, the azhar townsfolk enjoyed being largely left to their own devices. When the logging went well, the town would hold great festivals. When it went poorly, if the effort to cut the wood was too costly or some threat proved bloody to overcome, the townsfolk banded together and pushed on. 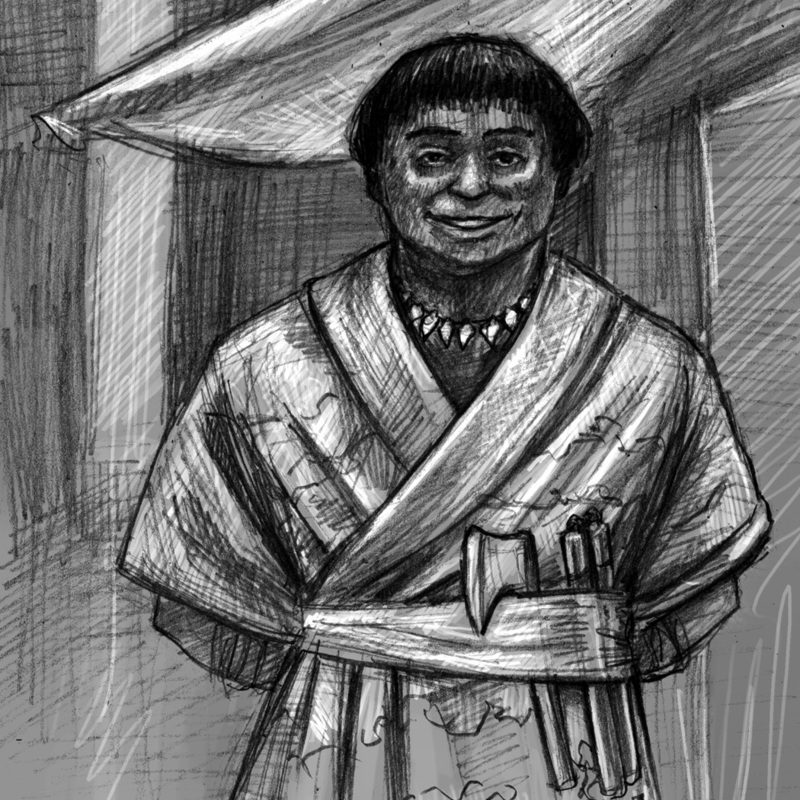 Janica’s family were well respected and rich, and used their considerable resources to help the less fortunate in bad years. Then came a very bad year. Illness spread rapidly through Tzeset, and dozens died. Entire logging parties failed to return from the woods, and supporting farms were razed to the ground. The azhar were saddened, but not overly concerned. Raiders from the Ivory Ports sometimes attacked outlying groups and monsters from the Broken Lands had caused damage in the past, but the town itself was always safe. Many of its bravest and boldest went out to find the cause of their ills, and set them right. Janica, more interested in business than warfare, paid such efforts no heed. Until none of the brave heroes returned. The situation within the town itself grew worse. Dismembered bodies were found in the street. Strange symbols were etched in alleyways. The town’s sewer system, a marvel of underground engineering built by gnomish experts from Iovan, began to echo with growls, moans, and cries for mercy. New disappearances occurred every week, and those who wished to flee the town soon discovered that small parties outside the town walls at night were beset by pale humanoids each night, and suffered even greater losses than those in Tzeset. Janica’s family organized patrols in the neighborhoods near their manor, and Janica did not hesitate to join them. 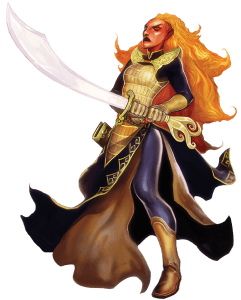 From above the mantle, she removed her grandfather’s massive falchion, supposedly forged in the City of Brass itself, and carried it over her shoulder. Both lone couriers and large, armed parties were sent to outlying towns and even Milsar, begging for help. None came. As the deaths and disappearances mounted, panic began to set in. The attackers grew more bold, bursting out of the sewers, covered in the stench of the place, to slash with long claws and bite with sharp teeth. Their victims often made no effort to defend themselves, and whispers began that the attackers were so horrific that to see them up close was to be paralyzed with fear. There appeared to be no safe refuge, no way to flee, and no hope of aid arriving. Janica’s family did not panic. They gathered together those friends and allies who still trusted them, and made a simple statement. This evil comes from the sewers. So into the sewers we must go, to seek out the source, and destroy it. Janica and each of her parents swore to lead whoever would follow in three parties, to assault the major entrances of the sewer all in one night. They asked for aid from hundreds of the people of Tzeset. When they gathered that night, they were joined by fewer than two dozen. Janica’s memories of that night are confused, and drenched with blood. Within the sewers were the horrific monsters of fang and claw, and the scent of them was worse than the smells of the sewers themselves. But there were also elves, humans, and even a few azhar, dressed in tattered robes marked with yellow sigils, and if anything they were worse than the pale creatures of fang and claw. Many of Janica’s allies died that night, but so did many of their enemies. And Janica discovered she could, if pressed, unleash her inner fire, her ancient hereditary connection to the efreet, and release a light so pure, the horrid pale attackers fled before it. Janica’s family hauled several mangled, clawed bodies to the surface, and showed the town the face of their horror. The creatures where white, with long elven ears, but hairless and hunched. They smelled of putrescence, they left wounds that festered, and their touch could paralyze. The Flameblade family searched the records of their family and found a name to put to this evil – “ghouls.” The next night, armed with scores of emboldened townsfolk, the Flameblades struck into the sewers again. And the night after, and the night after that. For three months, Janica and her parents lead the assaults into the tunnels and chambers beneath their hometown. Janica studied every ghoul corpse her group killed, and read every manual found on the increasingly rare yellow-sigil-marked cultists. Many of the people of Tzeset became adequate ghoul hunters, but Janica excelled. The town blacksmiths forged armor for her to wear, and her growing militia called her “Flamefist,” to honor her accomplishments. For a season Janica led the people of Tzeset in reclaiming their town. The ghouls became less and less common, and then suddenly one night there were none. The town’s sewers were fully mapped, with every new chamber and crude tunnel explored. The cultists had fled, leaving behind only a few notes on rituals used to create ghouls, and a vague mention of returning to “our brethren across the sea.” For the town of Tzeset, the long horror was over. But not for Janica Flamefist. She and her militiamen carried word of the attack to Milsar, and personally put it in the hands of the Sultan’s head Vizier. She then bid her militia return to their families, and stepped on a ship headed east. In her hand she clutched a scrap of a cultist’s journal, on which had been scrawled a single word. This week features three new additions to our ongoing PDF series. 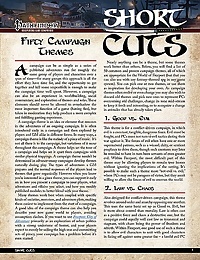 For Pathfinder Short Cuts, we have Fifty Campaign Themes. This is a 10-page PDF offering suggestions and guidance from Owen K.C. Stephens with themes new Pathfinder-compatible campaigns can be built around. Do you want to send the PCs on a voyage of exploration? Turn them into world-changing dam busters? Examine a technological revolution? A campaign can be as simple as a dungeon stomp, or as complex as you want it to be, and these themes can help a GM introduce new directions for a game as an overarching plot, or just a change of pace. 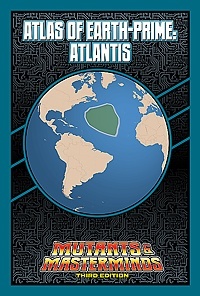 The Atlas of Earth-Prime goes from the surface of the world to beneath the seas, exploring the fabled lost continent of Atlantis. Once the home of the most advanced civilization on Earth, Atlantis sank beneath the ocean thousands of years ago, its surviving people transformed into aquatic water-breathers. For decades the House of Atlan—the Atlantean royal family—have held ties to the surface world and hero teams like the Liberty League, Freedom League, and the Next-Gen. Explore their mysterious homeland and dangers in the shifting currents of power in their undersea realm. 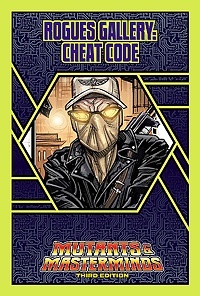 For Mutants & Masterminds Rogues Gallery, we have Cheat Code. Granted a wish for saving a young woman from attackers, Reggie asked for the ability to use cheat codes IRL. Now, as Cheat Code, he uses his smarts, skills, creativity, and “computer game” powers to pwn any noob he wants! Or, really, anyone he wants. Get the Cheat Code today—just $1.95! Today we present the second installment of our Short Cuts PDF series. These are tightly-focused PDF products that look at a single topic relevant to the Pathfinder Roleplaying Game. All Short Cuts are appropriate for use with Freeport: The City of Adventure, but can also be easily used in any Pathfinder RPG-compatible campaign setting. 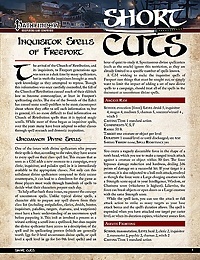 Inquisitor Spells of Freeport is a seven-page, full-color PDF featuring several new spells by Owen KC Stephens. The Church of Retribution brought its inquisitors to Freeport generations ago. This was seen as a dark time by many spellcasters, but in truth the inquisitors brought as much spell knowledge as they attempted to repress. The fall of the Church of Retribution caused much of their eldritch lore to become commonplace, at least in Freeport’s spellcasting circles. Revealed in this PDF are the spells arcane ram, astute fighting, battlelink, beneficence, censure, chastise person, crown of terror, crown of valor, draw on faith, fastheal, foozle, furious assault, locate individual, mark of apostasy, missteps, potent weapon, sanctum, steely will, strength of faith, thievesbane, and vigilance. 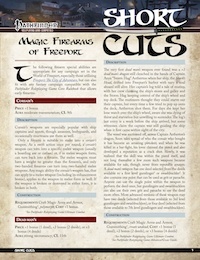 These spells are appropriate for any campaign set in the World of Freeport, especially those utilizing Freeport: The City of Adventure, but can also fit with any fantasy campaign compatible with the Pathfinder Roleplaying Game Core Rulebook. We are pleased to present the first installment of a new PDF series, Short Cuts. These are tightly-focused PDF products that look at a single topic relevant to the Pathfinder Roleplaying Game. All Short Cuts are appropriate for use with Freeport: The City of Adventure, but can also be easily used in any Pathfinder RPG-compatible campaign setting. Magic Firearms of Freeport is a six-page, full-color PDF featuring new magical abilities for firearms and powder, by Owen KC Stephens. A corsair’s weapon can transform from its firearm form to a melee weapon. A hairtrigger firearm is infused with magic to help a wielder strike unexpectedly. A firearm or crossbow imbued with the rumlord’s ability contains a hidden–and deadly–surprise. This PDF includes eleven enhancements for firearms, and three types of special powder. These firearm special abilities are appropriate for any campaign set in the World of Freeport, especially those utilizing Freeport: The City of Adventure, but can also fit with any fantasy campaign compatible with the Pathfinder Roleplaying Game Core Rulebook that allows early firearms. A lot of GMs drawn to Freeport: City of Adventure are relatively new to the Pathfinder RPG, and many who aren’t new to Pathfinder are new to running adventures in a city focused on pirates and cults to elder horrors and serpentfolk. A great deal of advice for both groups is available, much of it in Freeport: City of Adventure, and the Pathfinder RPG Core Rulebook. 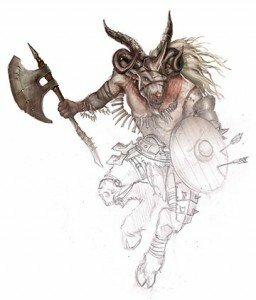 But especially given how well Freeport allows a GM to draw in options and monsters from any setting, I thought it might be useful to go over a few oft-overlooked basics on building creature encounters in Freeport. It’s easy to think a pirate-and-cultists setting like Freeport should focus primarily on humanoid foes, but that can be a mistake. First, it gets boring to face nothing but more warriors and the occasional ranger or sorcerer. Second, PCs are much more likely to identify NPC abilities when they are drawn from the character classes the players can also choose from. And third, it means a weapon that is bane against magical beasts isn’t very useful to the player who wields it. Today’s Ronin Round Table draws back the curtain on some of the behind-the-scenes parts of creating our products. Art is an essential part of the look and feel of most games, and it’s the role of the art director (that’s me) to make sure all that art gets created. To give you all a little insight into the job, we’re going to answer a few common questions about what being an art director is all about. What does the art director do? As the art director, my responsibility is to make sure that all of the art that goes into Green Ronin’s games and publications is up to the standard we’ve tried to set over the years. I select the artists, assign and approve the art, and herd cats to make sure it all comes into our hands by the deadline necessary for publication. How does the art direction process work? It all starts for me with scouting out the artists who have the right style to fit the project. Games like Mutants & Masterminds have a radically different art style than Dragon Age or A Song of Ice & Fire. I contact the artists I want on the project, see if they are available during the timeframe I need them, and get them contracted if they’re interested in working on the project. Ideally, this is done about 4-5 months ahead of time, but circumstances often compress this a bit. The art order or brief comes next. This is a description or set of descriptions for the piece of art needed for the product. These can be written either by me or, more often, by the developer of the product, with my role being more to tweak or jazz up those basic descriptions. Sometimes the descriptions are general, sometimes really specific, and different artists work well with each type. In general, I try to art direct with a light touch when I can. I’m hiring the artist for their talents and inspiration, after all. I try to give them as much room to improvise as I can. The next step is to take that art order transfer it to the artist or artists. For a cover piece, this part is simple. For interior work with multiple artists, it’s a bit more involved of a process. The art assignments get broken up between the artists, taking into consideration both spreading the artists throughout the book for a unified look, and assigning the right pieces to the right artists based on their relative strengths. Next the artists submit their sketches for the assignments. I review them to make sure the composition is as strong as it should be, that the basic look is right, that any characters depicted have the correct look, and so on. If revised sketches are needed, the artist submits them, and once everyone is happy with where the piece are going, the artist takes the piece to its final state. If the project is for a licensed property, there’s one extra step: approval by the licensor. Most licensors require us to submit all of the original art we commission to them so they can make sure it depicts their world and characters properly. Some licensors want to see sketches, and some just care about the final result. There was a time when there was another step: the artists physically shipping their work to us for scanning. Fortunately almost all artists today (even those working in non-digital mediums) submit digital files. Considering the international nature of the artists we work with, that’s especially fortunate today, with international shipping costs being what they are. Once all the art is approved, the art director gives it a look to ensure it’s in the proper color and file format, and that it will reproduce properly when actually printed. After that, the image file is handed off to layout for insertion into the product. The art director’s work is done. Where do you find artists? Anywhere and everywhere! The Internet is a fantastic source, of course. Sites like DeviantArt, Artstation and DrawCrowd give artists a place to put their portfolios, and I browse around on them quite often. Sites like Tumblr and Pinterest are also fantastic art resources, both for finding new artists, and building “mood boards” for how I want a particular project to look. It sometimes takes a little internet detective work to find out who created an image found that way, however. Not everyone is great about tagging sources for what they post. Conventions are another great source for artists. Whether it’s a comic, gaming, anime or just overall sci-fi show, I always keep an eye out for creators whose style might work with one of our games. If we’re actually displaying at a show (like GenCon, for instance), portfolio reviews are another great source for me. And finally, email submissions come in all the time, and have provided me with some great people I might not have noticed before. Can I submit my art to Green Ronin? Absolutely! Anyone is welcome to submit their work (or a link to an online portfolio, preferably), to art@greenronin.com. Happy New Year, gaming comrades! I hope you all had a good holiday, and got some quality gaming in with friends and family. As has become a tradition here at GR, I’m here to spill the beans on our plans for the coming year. Last year was a bit awkward because in January I could not yet announce Titansgrave or the fact that we were designing D&D books for Wizards of the Coast. This year will be much less cryptic! So what’s have we got in store for you? Rather a lot, actually! I was chatting online the other day with a GM who is running a Pathfinder Roleplaying Game, when she noted that as much as she liked the look of Freeport: The City of Adventure, she was running a game set in another publisher’s campaign world. She felt that meant that as much as she liked Freeport, she didn’t have any use for it. I noted that I was a huge fan of the other publisher’s campaign world, and thought Freeport would make an excellent addition to a chain of pirate islands her campaign had. She liked the idea of adding Freeport, but was concerned it might be too much work. I talked to her about that idea for a bit, but really the fact that anyone thinks adding Freeport to their fantasy campaign might be too difficult means I have failed in my job as a Freeport developer. Even the World of Freeport-themed pdfs we’re releasing (starting soon!) are intended to be 100% compatible with whatever Pathfinder Roleplaying Game adventures and settings you’re already using. As long as you like the ideas of pirates, ancient inhuman civilizations, eldritch evils, and a big, highly-detailed urban game setting, Freeport: The City of Adventure is for you! So, let’s talk a little about ways to move Freeport to wherever you need it. Freeport is an island-based city-state, so it’s easy to drop it into any ocean in any fantasy campaign. If you don’t want to make any changes to Freeport’s background, you can also drop its primary rival (the slaver-port of Mazin) and its primary trade partners (the nations of The Continent) into even more far-off oceans. With this set up, Freeport becomes the midway point between whatever lands your campaign already has, and the nations mentioned in Freeport: The City of Adventure. This allows any references Freeport itself has to foreign lands to be used unchanged, but those lands are so far from your main campaign setting they have no interaction with the existing kingdoms of your world. There are lots of advantages to this set-up. First, it’s easy. While there are some political plots and npc histories mentioned in Freeport that tie back to Mazin and The Continent, none of them are crucial to using the city itself. By making Freeport a major trade stop between your main campaign setting and Freeport’s own background locations you both get to use anything from Freeport without having to change campaigns. You also get the benefit of a new set of distant foreign lands people only hear about in vague stories and old captain’s logs. Very few campaign worlds are so well defined that there isn’t room for another small continent, far from the action, that a GM can use in the same way the New World or the Far East were used as placed people knew about but rarely went in many legends and fables. We called Freeport: The City of Adventure “The Ultimate Urban Campaign Setting” for a reason. In this 544 page book there are just 10 pages of campaign history, 15 pages of notes on the world beyond Freeport, and a whopping 303 pages detailing the city itself, its districts, shops, gangs, taverns, and newspaper (including numerous headlines that can be used as plot seeds, rumors, or just background color). There are discussions of favored drinks, narcotics, communication, markets, schools, legends, notable NPCs, and of course businesses – all the things that make a fantasy city feel like more than 12 encounter locations outlined for a single adventure. Even if you don’t want to incorporate all of Freeport into another setting, it has hundreds of pages of material that can easily be plucked and placed into any fantasy city your players are exploring. If a chase scene breaks into a building you haven’t detailed, rather than shrug and tell PCs it’s another tavern you can use entries in Freeport: The City of Adventure for Death’s Spoon, Kellamog’s Bell Shop, the Society of Lobstermen, Santori’s Hat and Haberdashery, or scores of other shops and guilds. If players want to contact the local thieves’ guild and your adventure doesn’t mention one, Mister Wednesday and his Canting Crew will be more than happy to step in. If they suddenly decide to take an ocean trip, the Freeport Docks has details on ships from the infamous pirate vessel Dirty Swan to the humble trading ship Rotten Apple. Very few fantasy cities have ever been described in the level of detail we provide in Freeport: The City of Adventure. While we think that makes it awesome enough you’ll want to use the whole city, even if you don’t want to add it to an ongoing campaign it can be used as an excellent resource to fill out elements of almost any fantasy settlement you are using. By the same token, the new Pathfinder base classes (freebooter, monster slayer, noble) npc class (cultist), races (azhar, island trolls), archetypes (corsair, crime boss, grenadier, inquisitor-mage, musketeer, sea dog, survivor, witch hunter), feats, traits, weapons, spells, and magic items in Freeport: The City of Adventure can be added to any Pathfinder-compatible game without having to add all of the associated Freeport background. Another option is to grab Freeport itself, and just swap anything from Freeport mythology and history to match an appropriate option within your existing campaign world. Mazin can be traded out for any city well-known for slaver ships. The Continent is replaced with the main landmass you are already using. Firearms can become crossbows with ease, or can be restricted to just Freeport and one other nation where they were invented. The serpent folk empire of Valossa is swapped for any ancient fallen inhuman empire, and the ancient god Yig becomes a stand in for any ancient sleeping elder horror of a god. The details of Freeport itself are new and lovingly crafted, but the bedrock it’s build on are classic ideas with near-equivalents in many fantasy campaigns. If you don’t want to add Mazin and The Continent to your campaign world, just don’t! We focused on the fun stuff within the city of Freeport proper, so it’s easy to drop the city into any setting without worrying about the exact politics, trade rules, and religions of all the other nations around it. Or you can take all of the Freeport mythology, and use it to combine as many campaign worlds as you want! One of the underlying assumptions of the World of Freeport is that rather than being a section of a round Earth-sized planet with all the normal rules and physics of the Earth, it is instead part of the body of Yig, an elder god. When the universe was created, Yig formed an island to command from the cosmic soup of possibility. Later, he sent coils of power out to draw in other realities to his own, which were in turn conquered by the serpent folk who worshiped him. Though Yig now sleeps, the World of Freeport is still built from his coils, the medium through which different lands are connected. One advantage of adopting this cosmology is that it allows a GM great flexibility with what finds its way into a campaign. It’s perfectly possibly to set up anything from any books as independent worlds unrelated from one another, but connected by the strange effects of the coils and the power of mystic navigators to allow ships to sail from one campaign world to the next. This may be something easily accomplished by anyone who knows the trick (“second star from the right, and straight on ’til morning!”), or it may require the same sorts of foci and power needed for plane shift and similar magics. Or, of course, perhaps all sea routes lead to Freeport. Anyone can sail from their home campaign world to Freeport without difficulty, but it’s harder to get from Freeport to anywhere but back to your native reality. This makes Freeport the ultimate melting pot, with its own backstory and related islands, but also filled with travelers from dozens of different realities, all arguing about who has “correct” sea charts and which set of islands and homelands are real and which mythological. As the Port at the Center of Reality, Freeport can become a nexus for adding anything the GM and players find interesting, or even an option for low-level characters to engage in a bit of planar adventuring from the deck of a ship. There are lots of ways to use Freeport: City of Adventure in any fantasy campaign, and we’re not going to try to tell you which one is right for you. Even this list is just a short selection of the easiest ideas, and we hope it sparks your imagination on ways to use the book to add more fun to your gaming. Or at least throw your players a curveball. Freeport: City of Adventure is the biggest book Green Ronin has ever produced, and is a huge part of the Freeport Kickstarter we ran. While that Kickstarter still has a few straggling items to be fulfilled (we’re working on the Hero Lab files, the serpentman figure, Return to Freeport, and all the other rewards people still have coming), we also need to look at how we’re going to support the Freeport line going forward. 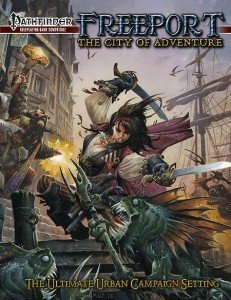 So far Freeport: City of Adventure is one of two big Pathfinder-compatible hardbacks we’ve released in the past few years, the other being the amazingly popular Advanced Bestiary. While those big books have been a lot of fun to produce and extremely satisfying to complete, they also take a lot of time and effort. Especially with a number of things taking longer than we’d hoped, it doesn’t seem like a good time to plan many more 300+ page books in the near future. But we DO want to continue to explore and expand the world of Freeport, and support the Pathfinder Roleplaying Game. So, starting this winter we’ll begin releasing some short World of Freeport pdfs. These will be general Pathfinder-compatible products that present a wide range of game material (ranging from advice on campaign themes to new weapon enhancements and even new character classes) and detailing how that material can be used to expand the world beyond the City of Freeport. This will allow us to both offer new products to our Pathfinder fans, and see which of the places that we’ve only mentioned in passing in previous Freeport books our customers want to learn more about. 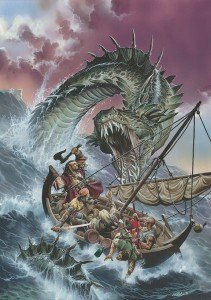 We DO have plans for more big, beautiful books ranging from a bestiary to possibly an expanded campaign setting, but rather than make everyone wait months in between every big release, we hope to establish some smaller, easier, more manageable options fans of both Freeport and Pathfinder can enjoy in regular doses. I’ll be watching fan feedback on these releases more intently than usual, so I can see if some concept or region becomes an early frontrunner for more products and greater expansion. The World of Freeport is an amazing and dangerous place. We’d like to start to share more of it with you. Shark Week’s Wednesday freebie is the Tranquil Shark Protection Agency from the pages of Freeport: City of Adventure for the Pathfinder RPG. Positioned on the edge of Drac’s End, the oddly named organization exists to meet the security needs of Freeport’s less affluent citizens. Headed by the smiling Bill Sangapulatele, the Tranquil Sharks use martial arts, community connections, and plain old common sense to defend their clients from assassins, debt collectors, and other enemies. The PDF includes general material on Drac’s End, too. Tomorrow, it’s back to superheroes with a shark-themed villain for Mutants & Masterminds.